King’s Quest: Once Upon a Time keeps the King’s Quest reboot going strong as a highly recommended title. For those still on the fence and want to know more about the ins and outs on how the game actually runs, you can check out my review of A Knight to Remember (Episode 1) here. This article has been written to give my ongoing thoughts on the series, with a view for a full-blown final review of the overall series once the epilogue releases. Like my thoughts on episode two, this article will contain some minor spoilers, so beware. 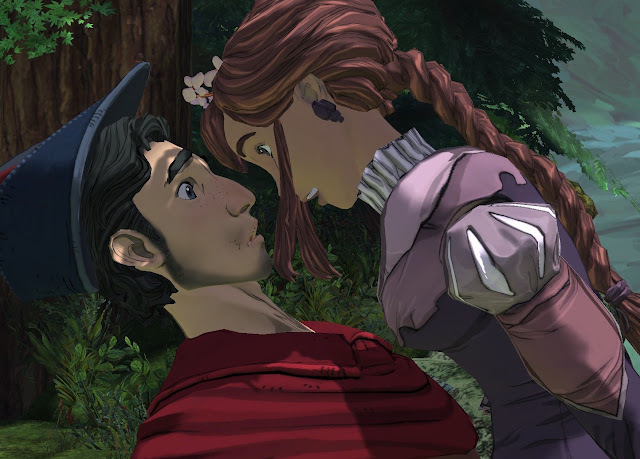 In my last King’s Quest piece, I said that Episode Two was all about decision making. At this point I can attest that decisions still play a large part of the overall story. Rather than making tough decisions on which of the townsfolk get to stay alive, as you did in previous chapters, this time around it is Graham’s duty to make choices on his one true love. Fans of the original series from way back when will remember that King Graham climbed the ivory tower after dealing with a lot of dangers and perils along the way. This version, however, is an expansion of sorts onto that original story. 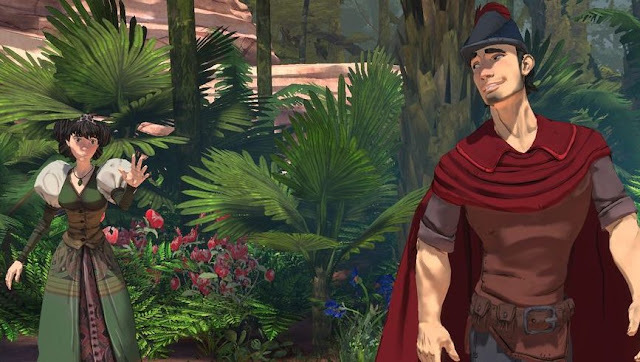 As is the norm with King’s Quest, in this game the ancient King Graham recounts tales of his youthful days to his two grandchildren. His granddaughter, Gwendolyn, remarks that she’s heard the tale about how Graham suffered many perils to save Princess Valanice from the tower where she was held captive by the evil witch Hagitha. King Graham tells Gwendolyn that he has never shared the full story, and so the memories begin. Set what appears to be some years after episode two, King Graham is now a much larger man than what he once was. Despite his newfound fitness regime, however, many of his townsfolk have moved on and his knights are forbidden to join him for dinner as per an old decree. With no one to share his dinner with, Graham looks to his magic mirror for assistance. Upon seeing a beautiful woman trapped inside a tall tower, Graham vows that the woman in his vision must be the love of his life that will fill the void that has grown inside of him. The episode then skips the entirety of the story of the original King’s Quest II in a small yet controllable montage. Graham then climbs the tower before discovering there are in fact two beautiful princesses trapped by a spell inside the highest point. Soon Graham discovers that their names are Princess Vee and Princess Neese (get it?). Indeed, the biggest choice that needs to be made in Once Upon a Climb is to decide who gets to be Queen Valanice. The beauty of this episode lies in the fact that the game decides for you towards the end of the episode, seemingly based on your choices and conversations had during the episode. Throughout the episode, Graham must assist the princesses in cleaning their room, fixing their items, playing board games with them and going a couple of adventures, one for each princess. While this may sound a lot more mundane than the previous episodes that had more action, espionage and cunning, this episode still serves a purpose in the telling of how Graham grows as a human being and a leader (and is a pretty cool pun on the whole "The Bachelor" public courting ritual that is so popular in our entertainment these days). The main drawback in Once Upon a Climb lies in the fact that the puzzles are a lot weaker than the previous games. The board game played in this episode is based upon knowledge of two personalities that Graham hasn’t gotten to know yet, and the rest of the game goes through the motions, not unlike what we see with the weaker end of the Telltale games. King’s Quest usually does this better, and it was disappointing that the puzzles given weren’t exactly taxing. However, my biggest beef of episode two was the fact that the decisions that Graham made during that episode ultimately didn’t matter, with the end of the episode always falling the same way. I am happy to say that Once Upon a Climb makes choices permanent for future episodes. With the obvious play here that whoever Graham ends up with between Vee and Neese will remain until the series is over. It’s not huge, but it is a step in the right direction when compared to these types of games that boast choice without actually giving it. So far so good, then. Once Upon a Climb does nothing to damage what has so far been an incredibly enjoyable episodic adventure. I can only hope once the epilogue is over with, we can get a new Space Quest game!